China has stepped up construction of detention camps for the Muslim Uighur minority as the country’s security spending on its “open air prisons” increased by nearly threefold over last year’s figures. Meanwhile, Chinese spending on security-related construction spiked by nearly 20 billion yuan ($2.9bn), according to a report by the U.S.-based think tank Jamestown Institute. It constituted a 213 percent increase over last year’s spending figures. Many refer to China’s Xinjiang Uighur Autonomous Region -- home to many ethnic minority groups, including Turkic Uighur people -- as East Turkestan. They believe that the Uighur are among a number of Turkic tribes that inhabit the region, and consider it to be part of Central Asia, not China. Since the start of 2017, China has expanded its concentration camps to cover an additional 2 million square meters, according to a report by the Australian Strategic Policy Institution (ASPI). 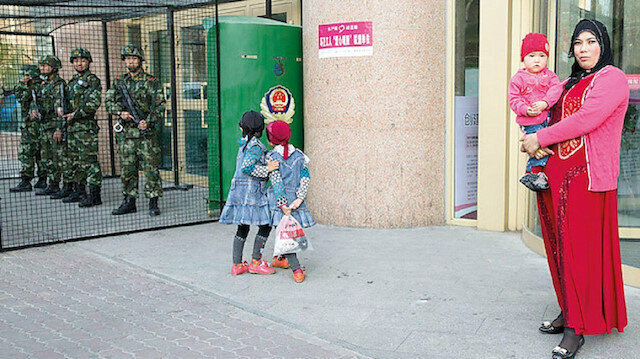 China’s Muslim incarceration camps have attracted heavy criticism from the international community as Beijing continually denied their existence and repeatedly rejected allegations of abuses against the country’s Uighur minority for years, opting to call them “vocational camps” instead.